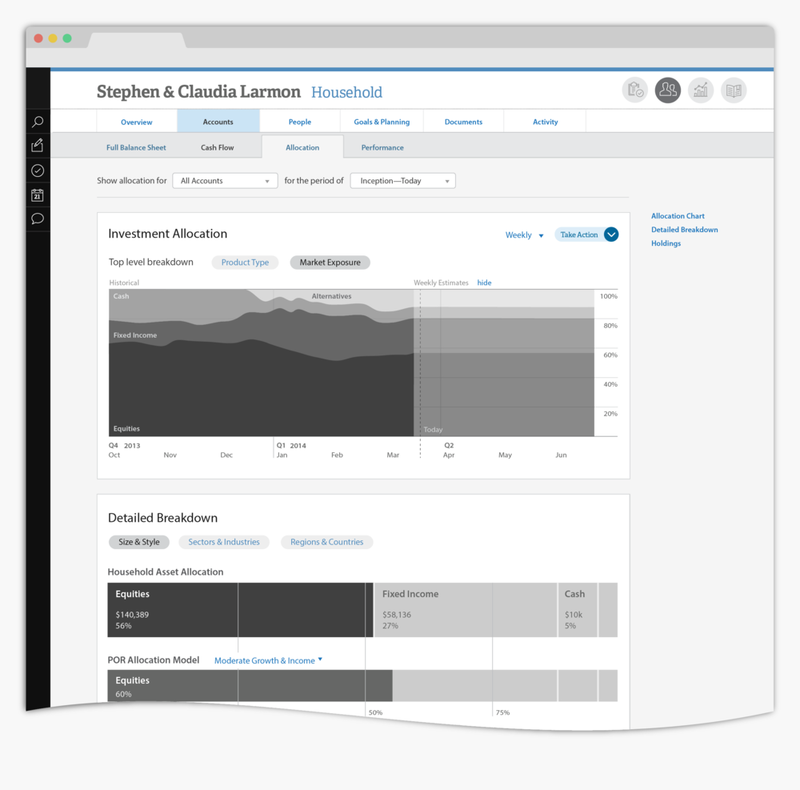 Wells Fargo Advisors engaged our team to re-envision their wealth management platform as a modern web application. While I wore many hats in this project, this section summarizes how I redesigned the Client Accounts section by putting people first. After conducting months of exploratory research with stakeholders and over 50 users, I took on ownership of the Accounts redesign. 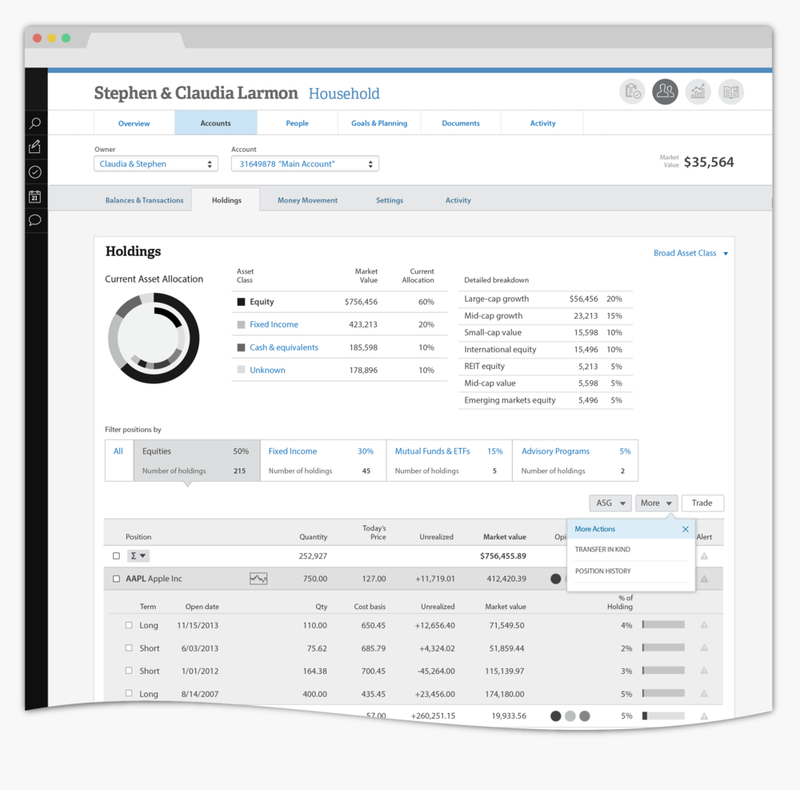 Household Accounts are the core to a wealth management system; it's where ongoing monitoring, trading, and money movement happen. The legacy system to access a client's accounts was composed of multiple applications, all based on the individual Account as an object. The human owning the account was treated as a secondary piece of meta data. In addition to these challenges, the legacy applications lacked consistency and did not meet modern accessibility standards. Users were often confused, frustrated, and felt long hours on the phone with internal support. To create a MVP concept for the account section, we looked to the most common tasks users needed to accomplish. After a couple of rounds of Contextual Inquiry, we were able to establish daily tasks relating to Accounts data. Quickly answer the common client question "How am I doing?" To reinforce our task-based approach, we started with workflow scenarios outlining how users would accomplish their tasks in the new application. We reviewed 7 of these scenarios with a core group of users, refining them based on their feedback. The new application would bring together the disjointed legacy experience with an architecture allowing users to 'drill' into accounts from an overall summary. 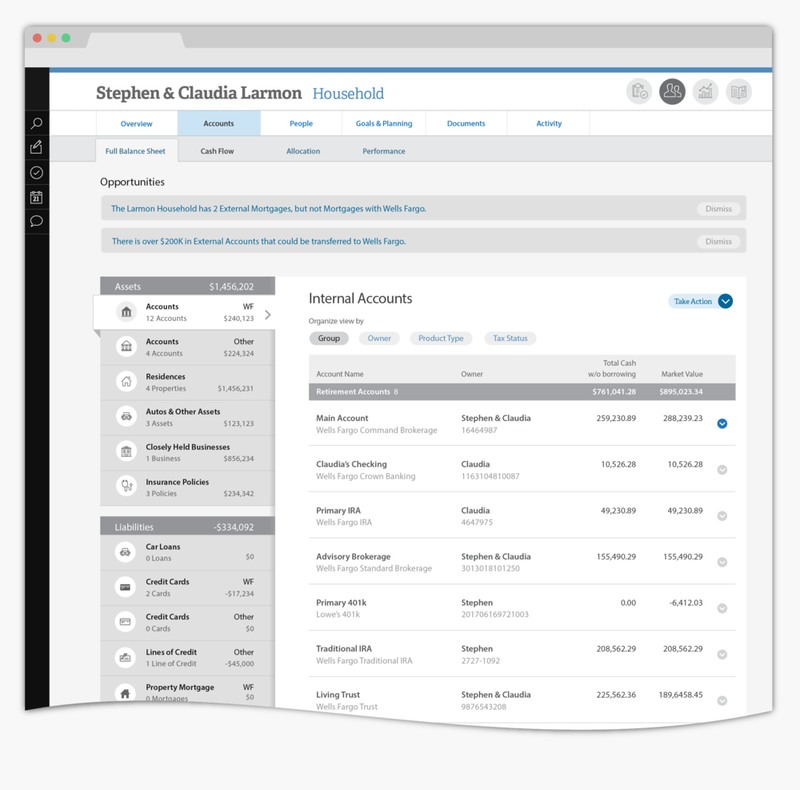 This gives both user groups a common starting point; on the same screen they can view a summary across accounts and also drill into a specific account that's easy to pinpoint, even without an account number. Instead of moving to a new application, users can look 'across' accounts by moving horizontally through the summary tabs. Within each of these categories, they can further select a subset of accounts, if they need a specific view. For users that generally do individual account maintenance, navigating to sub accounts is very straight forward. From the landing page of all accounts, they can click on any account listed in the table. Within the Account Detail section, we aimed to streamline the core legacy application and increase ease of use. We maintained the feature for users to switch between household accounts and improved table views with better filtering functions. Lastly, we pulled in additional functionality, connecting a formerly external app for transferring money and bringing in firm recommendation data tied to each security held. The interactive prototype our team delivered to the client was widely circulated throughout the client organization. It set the vision and tone for years of upcoming projects, including a new view in the client's household, improved interaction patterns, and visual styles. Many thanks to my co-designers Andy and Ryan for such a fun collaboration.